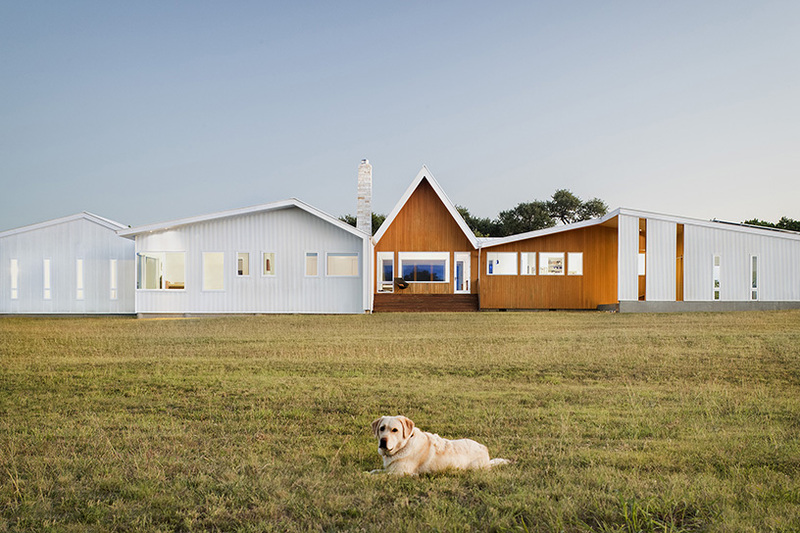 conceived as a prototype for a sustainable rural community, the hill country house designed by miro rivera architects serves as a beacon to show what a self-sustaining home in a rural setting, virtually independent of municipal water and energy could be. 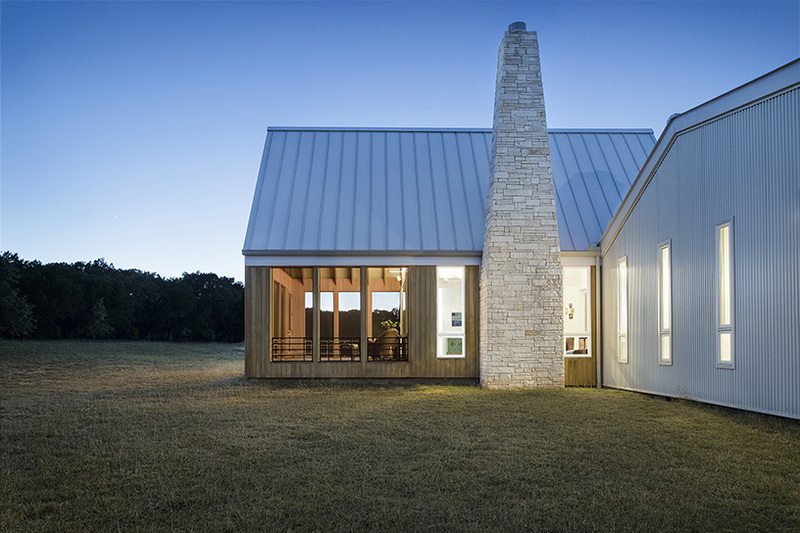 situated on a sweeping texas hill country meadow, this private residence is defined by a series of jagged roof peaks inspired by the rise and fall of the surrounding hills. 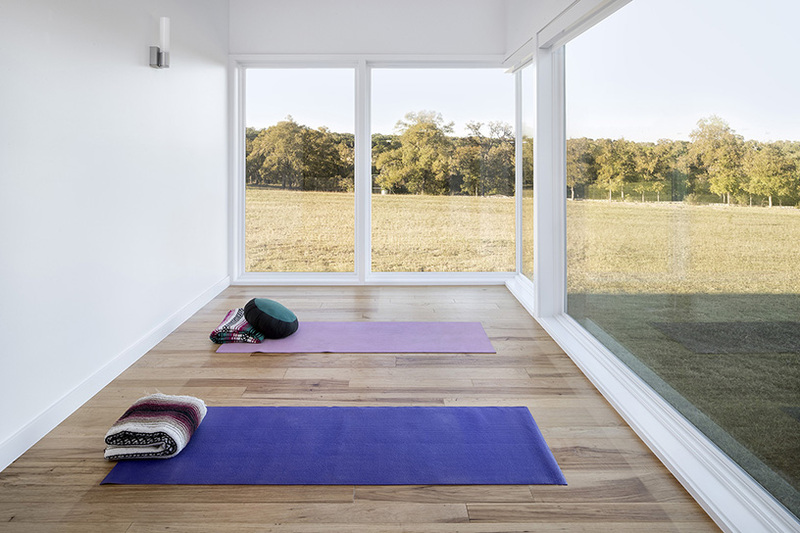 lovingly referred to as ‘the sanctuary’ by its owners, an active retired couple, and executed on a very modest budget, miro rivera’s modern take on the farmhouse vernacular is a place to bring people together and find spiritual renewal in a responsible, sustainable setting. 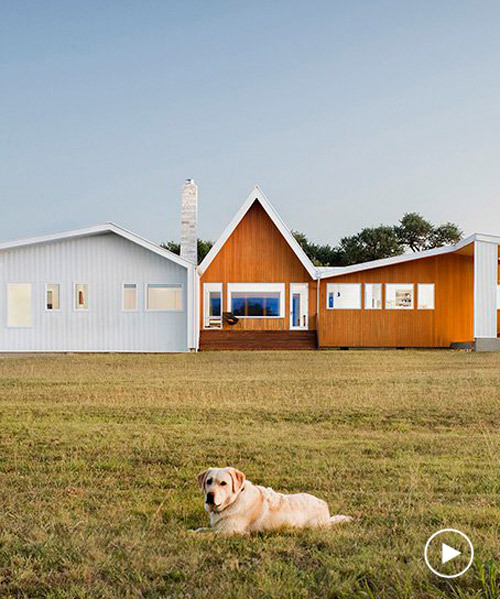 the exterior of the home is defined by clean lines, a sculptural gable roof, and a contrasting material palette of corrugated aluminum and warm cypress. 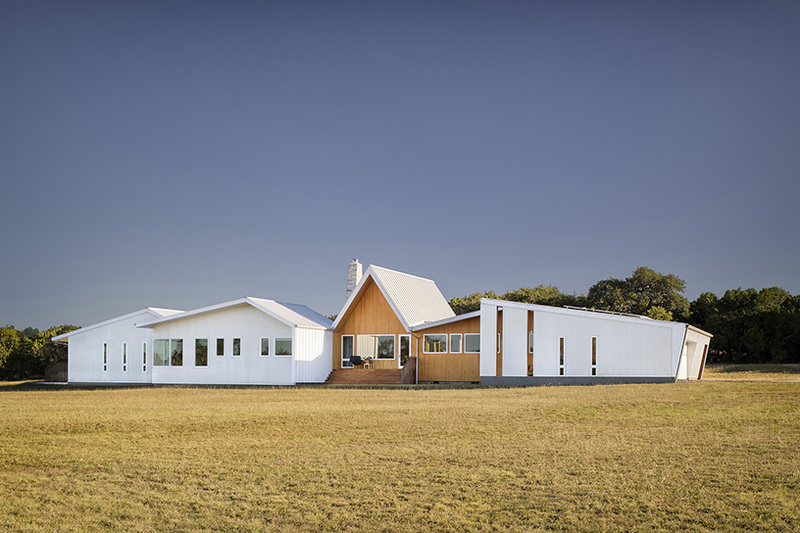 while indicative of the clients’ modest budget, the materials also evoke the residence’s rural setting. 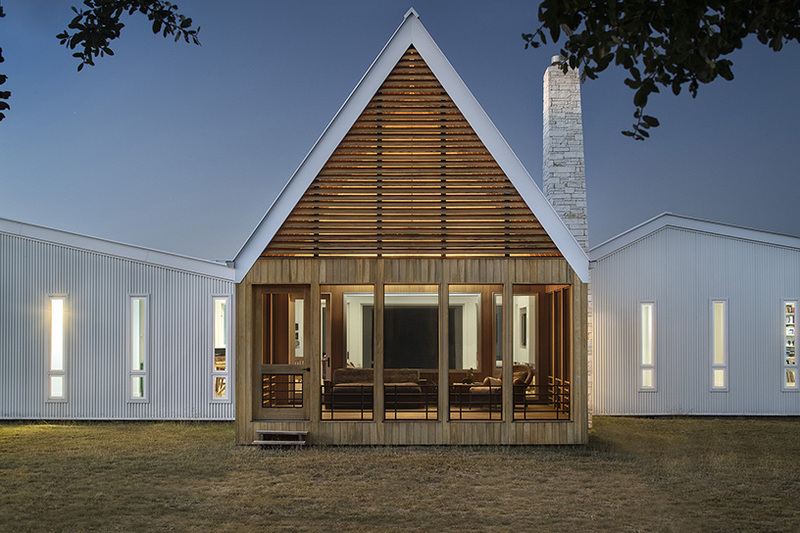 a tapering limestone chimney was inspired by an existing shed on the 47-acre property made of dry-stacked local stone. 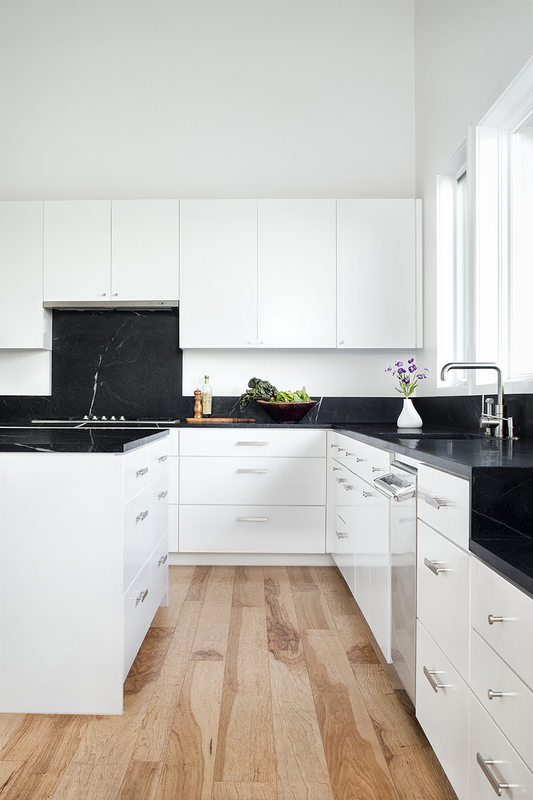 throughout the interior, white walls and ceilings are offset by carefully-considered embellishments such as a limestone hearth in the living room and soapstone counters in the kitchen. 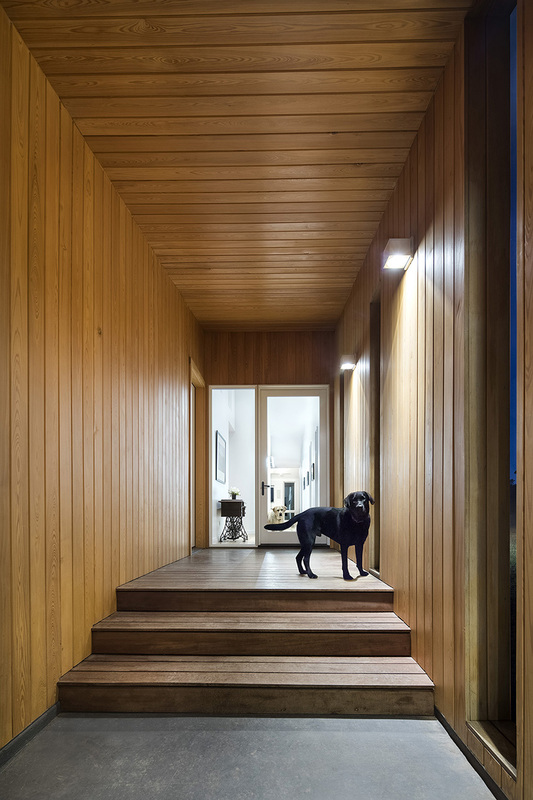 pecan floors are a nod to the home’s rustic surroundings. 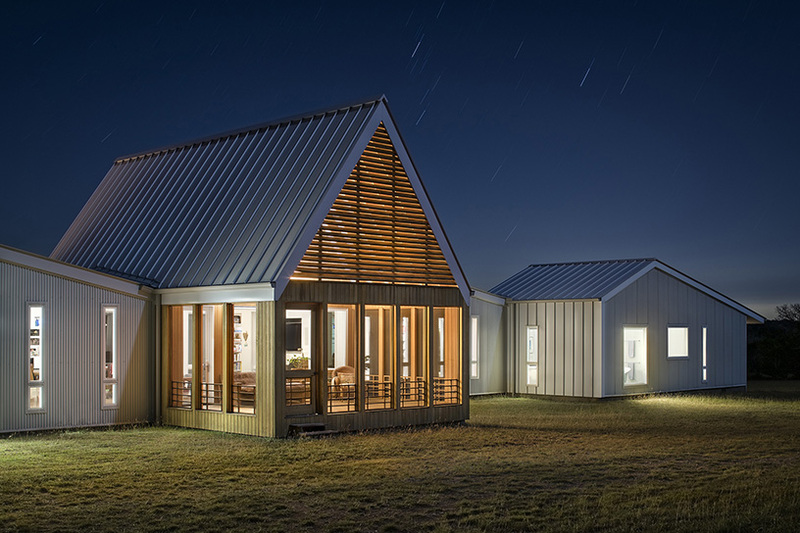 in plan, a collection of volumes is arranged along a central spine reminiscent of vernacular ‘shotgun’ cabins, with the public and private spaces of the home situated on opposite ends. 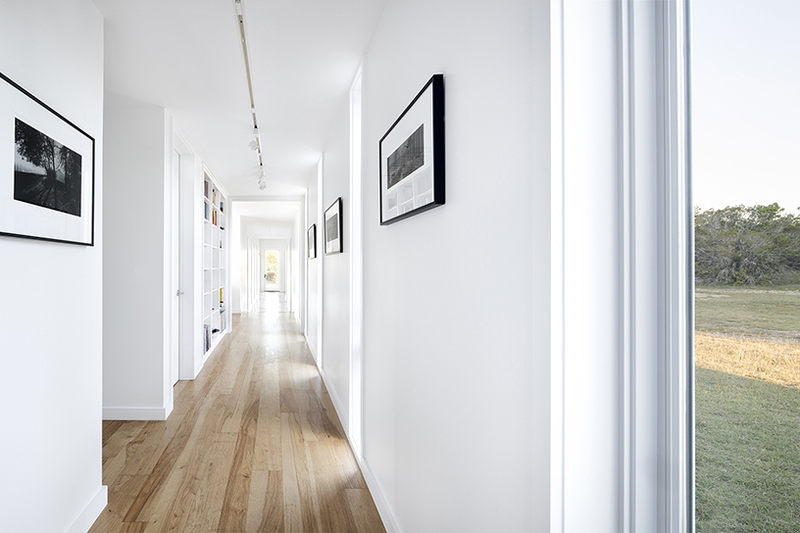 the main corridor, which doubles as a gallery, is differentiated by thin vertical windows that balance the requirement for natural light with the need to provide space for hanging artwork. 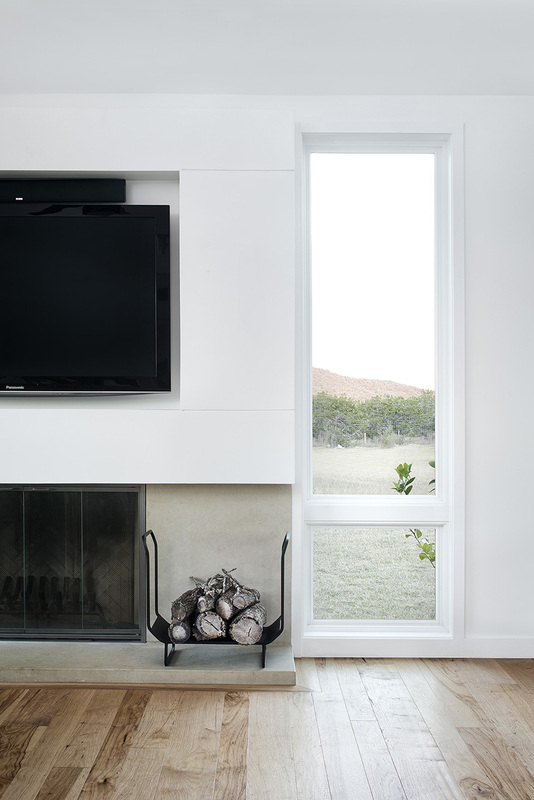 in every room, windows provide abundant natural light and frame views of the surrounding landscape. 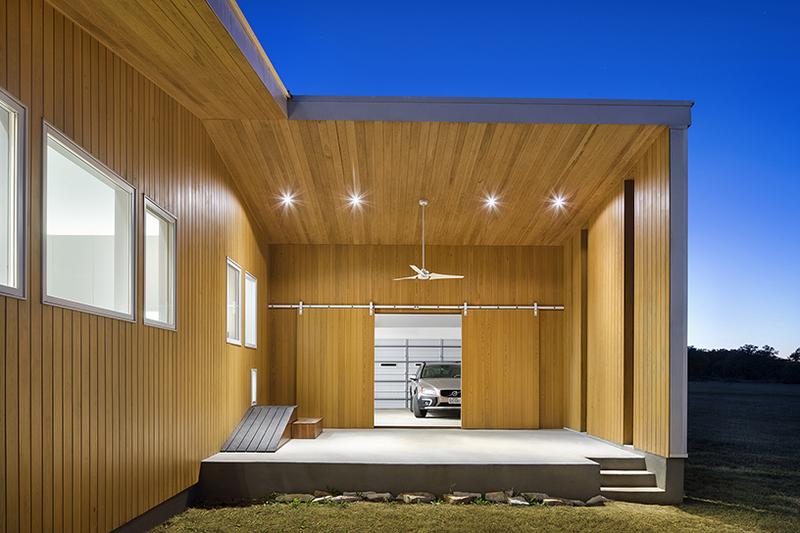 the stark white aluminum cladding is broken at various intervals by warm cypress siding that defines a series of rooms outside the house, including a temple-like screen porch that extends from the volume containing the main living spaces. 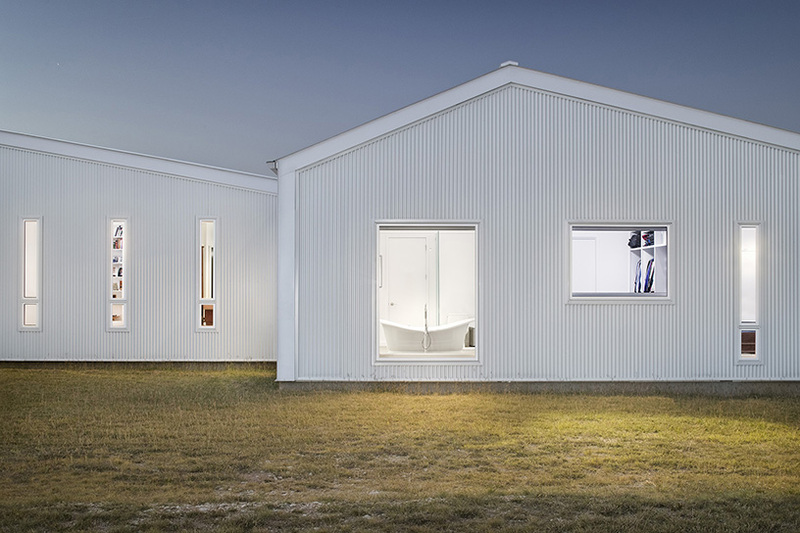 a shaded outdoor sculpture studio doubles as a stage for casual summer concerts hosted 3-4 times a year. an 8-kilowatt solar array supplies 80% of annual energy usage, generating approximately 40kw hours of electricity per day. mechanical heating and cooling are made possible by a 5-ton geothermal system consisting of a loop field of six wells drilled 250 feet into the ground. a 30,000-gallon rainwater collection system, designed to provide 200 gallons per day (enough for four full-time residents), meets all of the owner’s annual water needs, utilizing both charcoal and uv filters to purify rainwater collected from 5,300 square feet of roof area.